WHEELS: 20" X 8" SPLIT 5-SPOKE DARK SILVER machined finish, Tires: P235/55R20 M+S, POWER TILT & SLIDE MOONROOF, PREMIUM PACKAGE Rear Armrest Storage Compartment, Aluminum Roof Rails, Driver Seat/Steering/Mirror Memory - 3 Settings, driver's seat Easy Exit (auto away/return), Rain-Sensing Windshield Wipers, HEATED & VENTILATED FRONT SEATS, INTUITIVE PARKING ASSIST clearance and back sonar, BLIND SPOT MONITOR W/REAR CROSS TRAFFIC ALERT lane change assist, MATTE BAMBOO INTERIOR TRIM, TOUCH-FREE POWER REAR DOOR. 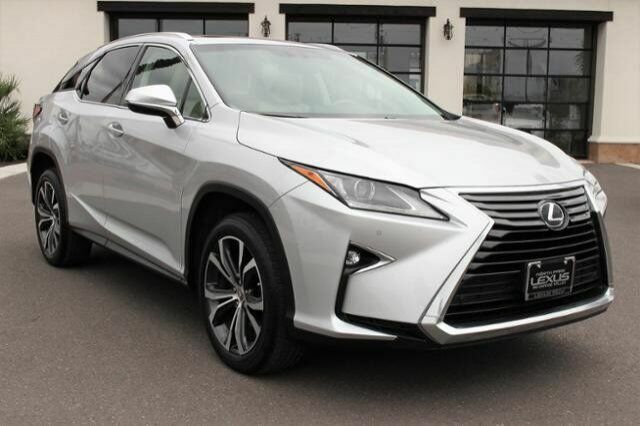 KBB.com explains "If you want a 2-row, 5-passenger luxury SUV that emphasizes serene driving characteristics and has a cabin that coddles, it's hard to beat the Lexus RX. This model has also set the standard for smart interior functionality, reliability and resale value. ".